Fern's back, and so things return to normal. First up, the latest shows! This week, hopefully better! A new face a Blizzard HQ makes us hope for a better, less retconny future. An invader hit Battle.net that could make the most populace MMO on consoles much more accessible, and the return of douchebags on dragons. Plus robot dinosaurs, exploring hellish mazes, and fighting the doldrums. This week, Fern's back! Many more details of the upcoming reboot of The Secret World, many of which ruffle the jimmies of existing players. Shenanigans about in Eve as the ultimate fight for anime rages and The amorphous blob of EA starts devouring another minion. As Fern is delayed from making it back home in time to join them on the show, Ari and Vaul launch once more into the thoroughly unstable waters of the two-man show, and not once do they manage to stay on topic for more than a few seconds at a time.Topics include Mythic+, Steam gifting policy changes, Yooka-Laylee, Secret World, Hearthstone and more other tangents than could possibly be listed here. 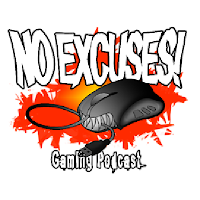 No Excuses - Episode 275 - Come Back Fern! Ari and Vaul once again try to carry a show without the estimable Fernurion to keep them in line, and as per usual, it's a complete catastrophe. Topics include, Celestalon's design incompetence, animé this season, Funcom insider trading, PETA and an incredibly bizarre proclamation from Phil Spencer.